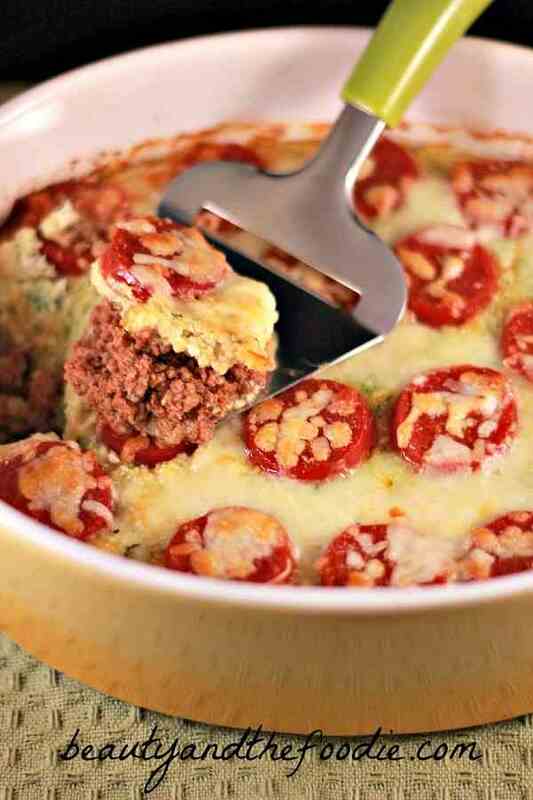 Primal Pizza Pie Layer Casserole is a grain free, low carb, and family friendly casserole. We love this pizza casserole at my house. Even the kids love it. The veggies are hidden, and you really can’t taste them. My daughter did notice the green specks of zucchini in the crust, but thought it was herbs. 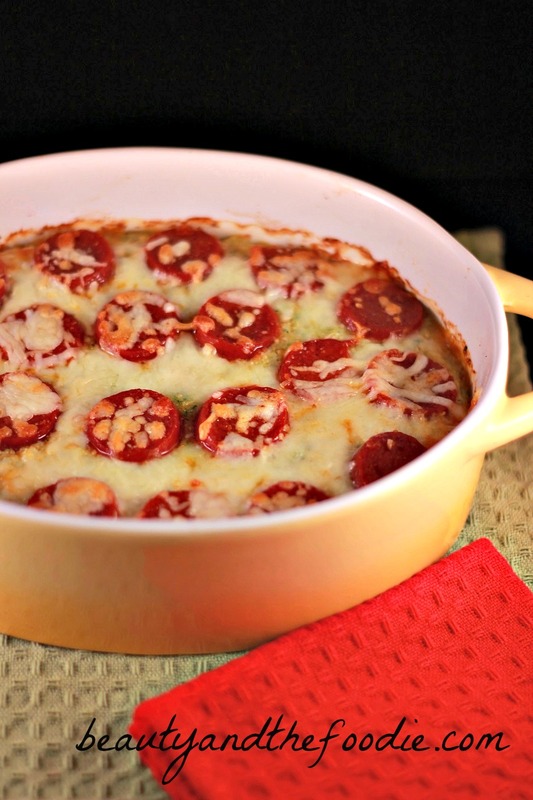 If you leave out the cheese, then this casserole becomes paleo friendly too. Makes great leftovers too, and can be made in advance and reheated. 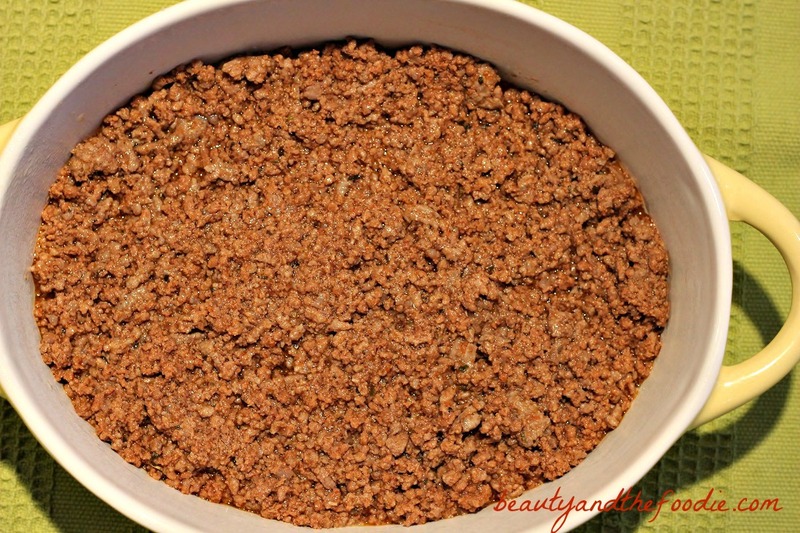 Finally, something grain free and low carb that I could bring to a potluck. While making this, I was going to drain the meat completely, but was too lazy to transfer from the pan, so I just poured a little off into a metal bowl. I was also going to strain and squeeze the ground zucchini, but also felt that was too many steps so, I just dumped it in as is. I put a little more coconut flour then I had originally planned on to absorb the zucchini moisture. Yay, it worked, I get to skip another step. What is your favorite kitchen short cut? Ground beef and sauce on bottom layer. Spread veggie crust layer over the top of meat layer. Smooth out crust layer with back of spoon or spatula. Place pepperoni on top of crust layer. 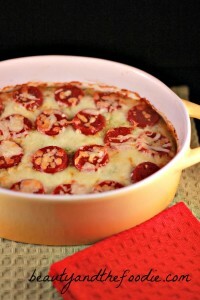 A grain free, ooey, gooey, pizza layer casserole! 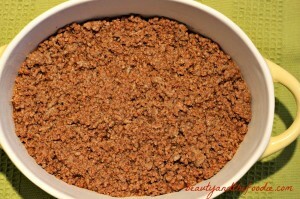 1 lb ground beef browned and lightly drained. ½ medium raw zucchini, grated or ground. 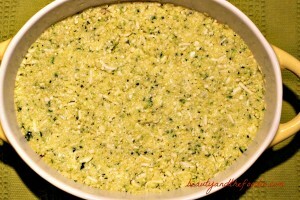 1 cup raw cauliflower grated or ground. ¼ cup grated mozzarella cheese or cheese of choice * can omit for paleo. 1 tbsp butter melted or coconut oil, melted. 16 slices of pepperoni or salami. ½ cup grated cheese of choice I used mozzarella * can omit for paleo. Preheat oven to 400 F, and lightly grease a 9 x 11x3 inch oval casserole dish. Using a large fry pan, brown ground beef. Lightly drain some excess grease. Add to ground beef in pan: tomato sauce, Italian seasonings, garlic powder, oregano, and sea salt. Stir and heat over medium high heat until bubbling. Turn heat to low and cover. Simmer for 6 minutes. In food processor add: zucchini, cauliflower, and garlic cloves. Process until veggies look like rice granules, or can grate them with grater or ricer. 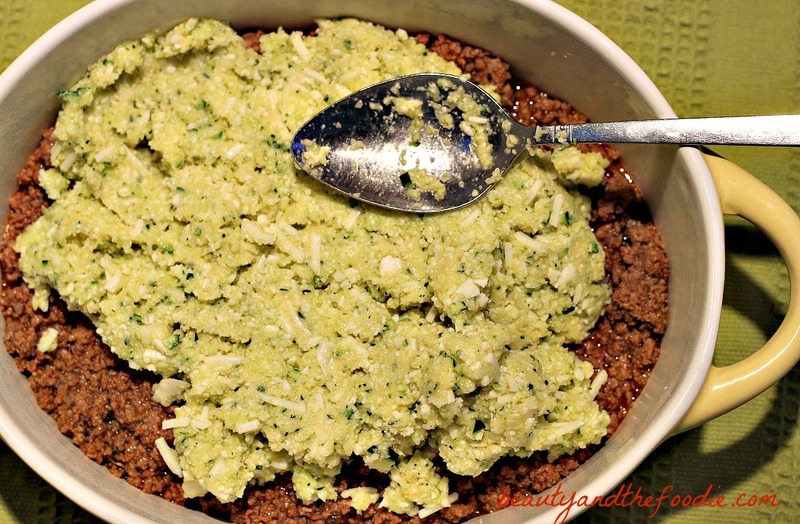 In large mixing bowl combine: ground zucchini cauliflower garlic, 2 eggs, 3 tbsp coconut flour, ¼ cup grated cheese, 1 tbsp melted butter or coconut oil, and ¼ tsp sea salt. Mix together until a paste like dough forms, and make sure to break up any coconut flour clumps. Set aside. Stir simmering ground beef, and remove from heat. 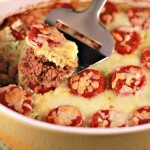 Spoon ground beef into casserole dish and spread across bottom of dish. Take veggie crust dough and spoon on top of meat layer in dish. With the back of large spoon or spatula, spread dough evenly across the top of meat layer and smooth. Place pepperoni slices on top of veggie crust. 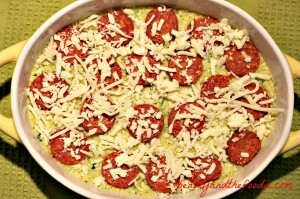 Sprinkle grated cheese on top of pepperoni and crust layer. Bake in oven for 30 minutes or until top of casserole is browning and crust is done. Nutritional data includes all toppings and cheese. Made this last night and it was great. Tasted like a pizza without all the hassel of trying to roll out paleo or keto dough. Thank you for sharing the recipe! Dawn, thank you so much for trying the recipe and your kind words & feedback. Prepping this right now – it looks so good! One question though… any reason why the crust doesn’t go down first? It’s counter intuitive for me. Plus my meat sauce is pretty saucy, just like we like it :). In that case, would it be ok to put the veggies down first, then the meat, then the cheese?? Cassie, If the crust goes down first (under the saucy meat) it would become soggy and mushy, so that is why it is on top. Cassie, oh no, I didn’t get to you in time. Do I measure the cauliflower before or after I great it? Charles, Thank you for trying the recipe and taking the time to share your results. I appreciate your kind words. I am thrilled that the kids approve! My kids are my toughest critics, lol. I added sliced red onion and spinach under the last layer of cheese. I cooked the onion and spinach just a little on the stove top before adding to the dish. Made this tonight for dinner, and it was awesome! I did add 1/2 a diced onion to the burger, going to be a new favorite! Thanks for the recipe! Made this last night and it was fantastic!!! I did add green pepper and mushrooms with the pepperoni. This will be my go to when having a pizza craving. Thanks for a delicious recipe!!!! Stacey, I hope they like it. I know what you mean my son and hubby could eat pizza everyday & my son won’t eat veggies if they are not well hidden. Manlings, I love that!! This looks great! I’m trying it tonight. Do you know if this would freeze well? If it would, I’d like to double it and save one for later. Lisa, I have not froze this, but some viewers have baked this, & froze it for later. So, I think it is doable. Hi. Just found your site and this recipe, sounds delish! Your serving size seems way to small for our family. A 9″ pie dish would serve 1 maybe 2 of my teens. 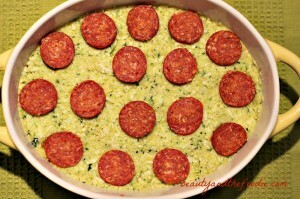 =) Would you recommend doubling the whole recipe if I want to make this in a 9X13 dish? Can’t wait to try it and I love that you suggested using the veggie crust layer as single pizza crusts in the comments above. Will the crust get crispy if use it that way? Thanks for the recipe. Lilia, I make this in a 9x11x3 inch oval casserole dish, not a 9 inch pie dish. So it is a much deeper dish than a 9 inch pie dish. I think a 9×13 inch would work as well without doubling, but you could double it and make two 9×13 or 2 of the 9×11 casserole dishes. The crust on this one one is more bread like, not a crispy crust, but it may work for pizza crust if rolled out thin between parchment papers. Lol, I know what you mean about teenagers. I have 2 college students and a 12 year old boy. Not to mention, my hubby, who eats like a bear getting ready to hibernate and does not gain weight (so not fair). 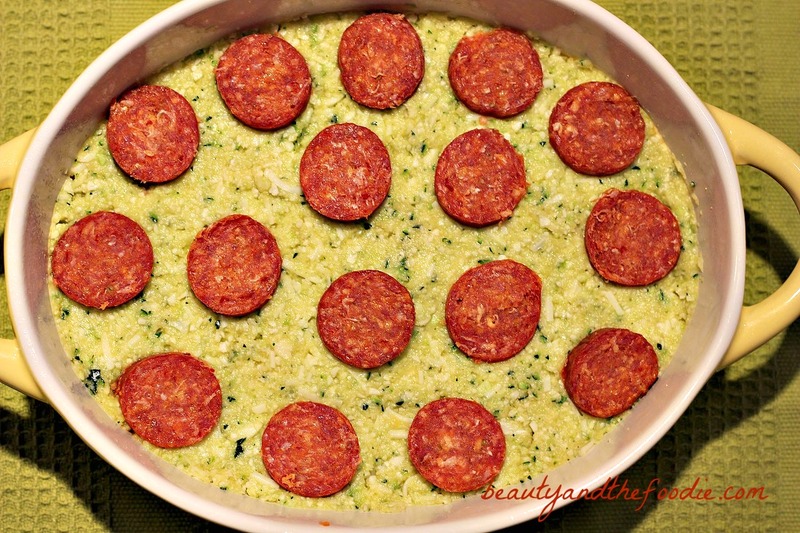 Made this today and it was fab but I made too much of the cauliflower crust. Any suggestions what I can do with the left over grated cauliflower and zucchini mixture? I have already mixed it with the eggs, butter etc. Hi Teresa, thank you, I’m glad you like it. The leftover crust makes an excellent crust on a quiche, also is good fried as patties in oil as a fritter. Can also be pressed between two sheets of parchment paper to make a regular pizza crust. Hi, could you explain the serving size as I don’t understand the size of 1 square. How many serves does this recipe contain. Caz, it is 1 serving out of 5 total servings. The info is at the top of the recipe card, but the print is so small. I will put it in the nutritional data as well to make it easier to see. Could this be frozen before it’s cooked? Hi Melinda, I have made this in advance, and left in the fridge until ready to bake. I have not tried freezing it yet, but I would think you could and would just need to bake for a longer amount of time. 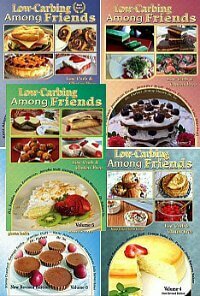 This looks great and I’m trying to do more l do more low carb foods. Do you think I could use frozen cauliflower after it’s thawed? Or would it be too mushy.? Amber, I think you could use frozen after thawed, but I would squeeze out excess water with a paper towel or cheese cloth first. Dani, I like the cast iron skillet idea it is genius! I am going to use one next time! Made this for dinner tonight and my husband was so impressed! I had half a sweet potato hanging around, so I threw it in the food processor, too! I also grated asiago cheese on top instead of using processed shredded cheese, and it gave it such great flavor! Thanks for the wonderful recipe! Rosanna, thank you for your kind words. And awesome tip on the sweet potato addition. That would be delish in there. I bet we could hide many different veggies in there. I’ve been slowly trying out new Paleo recipes on my family of seven (13, 11, 9, 4 and 2 months along with my husband and I,) and this was a hit. My 13 year old can smell coconut a mile away and claims to despise anything with it, but even she ate an entire serving. They had no idea how many veggies they were eating! The only complaint afterwards was that I didn’t make enough so they were still hungry! (I had already doubled the recipe.) I didn’t have pepperoni on hand, so that was left out. Might have to make it again soon with that included. Thank you! Dee, thank you for trying the recipe and giving me your great feedback. Wow, you have a big family, I have five including my hubby and Myself, and we can eat the whole pie(doubled) and a salad, well my son won’t eat the salad, lol. So you might need to triple it. Glad the kids liked it, I get so excited when mine eat veggies. Oh my! I have not made this yet, but am in the middle of making the menu for next week and ran across this on pinterest. We used to make something called crockpot pizza before going LC, but it used pasta. DD was just talking about it the other day – how it’s one of the things she misses. This just might fit the bill! Can’t wait to try it! Mama Owl, I hope your family loves it as much as mine does. Hmmm, you know this probably could be made in a crock pot. I will have to give that a go sometime. Thank you! Could I prep this ahead of time and bake later? I want to make this tonight, but I’m signed up for a barre class from 5:30 till 6:30, and don’t want to delay dinner too long when I get home. Thanks! Callie, I would think you could make ahead, and bake later. That’s what I did! Prepped everything, stuck it in the fridge and baked a couple of hours later! I made this for dinner last night and it was delicious. I added finely chopped red bell pepper and chopped spinach leaves just before the pepperoni. I was curious about whether I cooked it long enough because I wasn’t sure what the crust was supposed to be like. Mine was almost like a somewhat crumbly cornbread (in texture not taste). Should I have cooked it longer. Both my husband and I thought it was a great dish to add to our menu. Hilda, you did it right, the crust layer is supposed to be more like bread texture than pizza crust. It is a bit like corn bread texture. Thanks for sharing this recipe. We finished off the leftovers tonight and it was equally delicious. 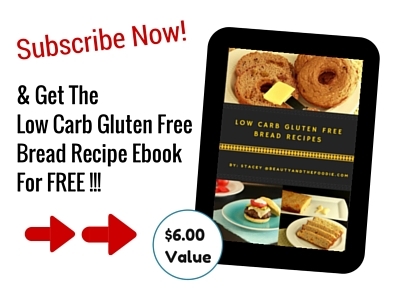 I am trying to make at least 3 new low carb recipes a week. I am enjoying the experimenting. Oh my, I hope my family loves it as much as those who left comments, so excited to try it! This was AWESOME! My husband who does not like cauliflower LOVED it! This recipe will be a regular in our home. The kids said they would like me to make it every week :-). Carrie, thank you for the great feedback! My hubby hates cauliflower too and so do my kids. So I sneak it in where I can. Happy that your family tried it and enjoyed it! This is a fantastic idea! I am curious, however, if anyone has an idea for replacing the cauliflower? I am allergic. Ally, Thank you so much. I know people can be allergic to anything, but you are the first cauliflower allergy person I’ve heard from. You can just replace the cauliflower with more grated zucchini (double the grated or ground zucchini) and omit the cauliflower. I think my husband wishes he was allergic to cauliflower so I would stop sneaking it into his food. This was great! We are big veggie eaters, but my husband usually shies away from this sort of thing. He wasn’t home when I prepared it, so I’m pretty sure he thought the zucchini/cauliflower layer was ricotta cheese or something. He had two helpings and is taking some for lunch tomorrow! I don’t think I’m ready to tell him what that layer actually was, though. Lol. Thanks for the great recipe! Sarah, thank you and great job being sneaky, lol. Sometimes husbands are more picky than the kids. I don’t always tell my husband until he has eaten it a couple times. That way he won’t suddenly change his mind just to prove to me he doesn’t like cauliflower. Thank you for the inspirational recipe! I made this last night and added broccoli to the crust, and hot sauce to the meat mixture. It was fantastic! I love all of your recipes! Joanna, you are welcome. Broccoli and hot sauce idea is brilliant! 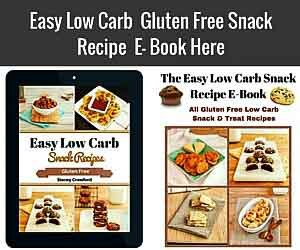 Thank you for your kind words and trying the recipes! Just made and ate this! Delicious! 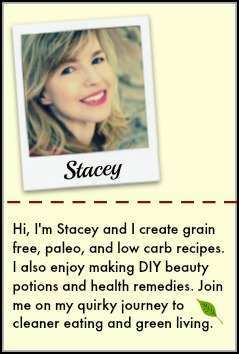 Krista, thank you for the trying the recipe and the great comment. Also thank you for taking the time to leave one! GiGi, thank you so much for your kindness and enthusiasm! I love your website and YouTube channel. You are smart, beautiful, really funny, and completely adorable. I think it is the first show I’ve subscribed to on You Tube. Very Entertaining!